Like the verse echoed by Rabbis (Ecclesiastes, Chapter three), at services inside Plaza; a Rabbi’s role at the end of life can sound similar: ‘A time to help prepare someone who’s nearing death and a time to console the family afterwards’. ‘A time to perform a memorial service for a long-time congregant, and a time to lead prayer for an unknown soul’. ‘A time to be a part of an end-of-life conversation, and a time to stop to simply listen’. 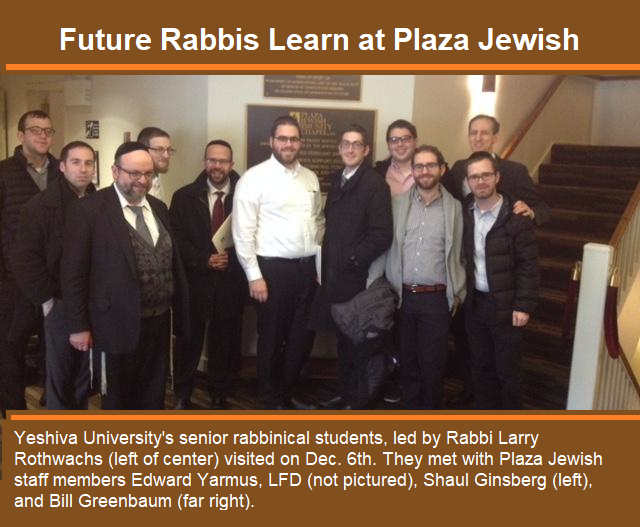 On December 6th, Plaza Jewish Community Chapel received a visit from senior rabbinical students enrolled in a lifecycles class at Yeshiva University-affiliated Rabbi Isaac Elchanan Theological Seminary (RIETS). For this special visit, they meet with Plaza staff for a behind the scenes look, tour and discussion on how funeral directors work with clergy when a death occurs. “Clergy’s role at the end of life, to the individual, to the family, to the funeral chapel, and to the community at large cannot be overstated”, says Stephanie Garry, Plaza’s Chief Administrative Officer. “As Plaza’s CAO, I have seen firsthand how impactful Clergy are. I am honored to have a board composed of nearly 40% Clergy, who’ve helped guide our trajectory from the beginning. I’m blessed to witness for over 16 years, Clergy from all denominations coming into our chapel each day, to lead services and console support mourners. Rabbi’s help Plaza fulfill our sacred mission, and we are grateful to have the chance to do our part, in helping this new generation of Rabbis, fulfill theirs”.